There is a controversy over the matter of runaway warming. I'm not talking about limited feedback effects but long term warming produced by a cycle of warming producing warming continuously. I'm inclined to believe it doesn't exist, at least within the sphere of life on earth. I simply don't know of any past examples and it appears that most climate scientists and the IPCC are inclined to agree. The PETM is often offered as an example of runaway warming but this wikipedia article on it doesn't mention runaway warming as a phenomena associated with it. But I could be wrong. 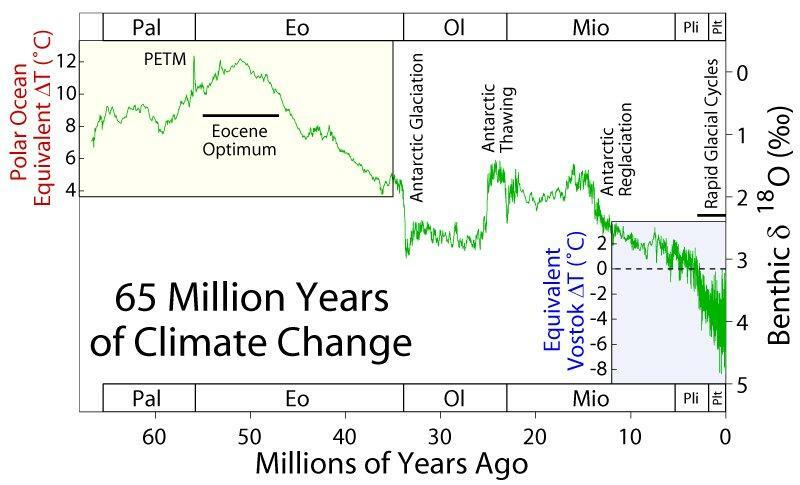 Here's a graph showing temperature going back 65 million years. Point out to me where runaway warming shows up. It may be that the definitions of runaway warming being used are different from the one you are using. Superimposed on this long-term, gradual warming were at least two (and probably more) "hyperthermals". These can be defined as geologically brief (<200,000 year) events characterized by rapid global warming, major changes in the environment, and massive carbon addition. This would be the reference to runaway global warming points if you used the definition of runaway warming as a rapid increase in temperature caused by passing a tipping point. The runaway warming would continue until a more stable condition was achieved. At that point the more gradual warming would either continue or not. If it did continue more tipping points could be passed with more instances of runaway warming. The runaway greenhouse effect has several meanings. At the least extreme, this implies global warming sufficient to induce out-of-control amplifying feedbacks, such as ice sheet disintegration and melting of methane hydrates. At the most extreme, a Venus-like planet with crustal carbon baked into the atmosphere and a surface temperature of several hundred degrees, an irreversible climate state. Between these two is the moist greenhouse, which occurs if the climate forcing is large enough to make water vapour (H2O) a major atmospheric constituent. In principle, an extreme moist greenhouse might cause an instability with water vapour preventing radiation to space of all absorbed solar energy, resulting in very high surface temperature and evaporation of the ocean. However, simulations indicate that no plausible human-made greenhouse gas (GHG) forcing can cause an instability and baked-crust runaway greenhouse effect. "geologically brief (<200,000 year) events"!! I would say we can get it down to a lot less than that and still call it geologically brief. I don't consider 200K years or even 100K years as being geologically brief, except on the macro scale, I suppose. From SKS and Wunderground, the heat buildup and GHG increase is 10 to 40 times the rate that led to PETM, and the ocean acidification rate is beyond that ever seen in the geology of Earth. This indicates very strongly that a very long term change will occur with a worse than the worst ELE outcome and longest recovery, if ever. It is not exactly known just how much sequestered carbon there is, but I have read from 100 to over 1000 times what humans have put out with fossil fuels and overpopulation's slash and burn recklessness. Hansen guaranteed runaway IF all the fossil fuel is burned. Half is gone so we are still looking at only 1/50th to 1/500th of the sequestered carbon. It doesn't seem that it could initiate the positive feedback loop that has been forming since 2009, but it has. The methane blowholes were a wake up call to the world, yet what could happen is scoffed at and efforts to lower HGHGs have been fruitless as time runs to either out now or out in 2024 or max out in 2030. The oceanic releases of CH4 have been much more and sooner than thought, and the Arctic was up to 9*C warmer than record in 2014. The tundra releases have also gone geometric but are still less than oceanic. This will NOT be the case in a decade when they are both much inflated. I think many scientists just do not want to look at runaway or even a worse than PETM ELE. Like the IPCC it is political to keep their jobs and not be pessimistic, but overblown conservative instead. People in the know realize that 2*C is too much by 2/10ths of a degree. Most think we will hit +4*C by 2050 or 2100, depending on just how optimistic they are. 1.8*C or higher is all that is needed to set up thermal max by methane turnover. Whether it stops at some point of warming or just keeps on with increasing depths warmed to release, on land and on sea. Some think that open ocean warming is the initial tipping point and we are past it stopping already. Yes, 1000 times the carbon released so far IS enough for the Venus Effect. Will it have enough momentum to go all the way? Who really cares when an ELE worse than the Permian is in store? Will any of the events happen that could stop it?????????? The last line would seem to speak to the issue as far as man's contribution. In addition I suggest you go out and find a serious climate scientist beside James Hansen that projects an AGW induced future that includes a runaway condition. What I run into are articles more along these lines. This guy is crying fire about a global warming future but no mention of a runaway anything, That seems characteristic of serious articles on the matter and reflects IPCC thinking. Obviously runaway means more than simply an enhancing feedback. It means we push things to a tipping point where nature then takes over - causing continued warming for a long period of time without human help rather than reverting in relatively short order to equilibrium. The last line would seem to speak to the issue as far as man's contribution. In addition I suggest you go out and find a serious climate scientist beside James Hansen that projects an AGW induced future that includes a runaway condition. WHICH definition of runaway condition are you using? WHICH definition of runaway condition are they using? You seem to be considering only one definition where there are more than that in use. What I run into are articles more along these lines. This guy is crying fire about a global warming future but no mention of a runaway anything, That seems characteristic of serious articles on the matter and reflects IPCC thinking. Obviously runaway means more than simply an enhancing feedback. Why is that obvious? The enhancing feedbacks that are uncontrolled would be a definition of a runaway condition would it not? It means we push things to a tipping point where nature then takes over - causing continued warming for a long period of time without human help rather than reverting in relatively short order to equilibrium. How long is that period of time? The residence time for atmospheric concentrations of CO2 is given in the hundreds of years. A methane release would involve the period during which methane was present and then when methane converted to CO2, but is that a sufficient period of time to be considered runaway given the multiple definition options? I guess that by runaway, you mean completion of a positive feedback loop like the 4 tipping points. Many think that the open ocean tipping point is passed and will lead to tundra and oceanic methane self release, followed by CO2 release. I certainly hope we have time to prevent the other tipping points from being completed. Once something can not be changed by human action and is basically controlled by the laws of nature, it is in 'runaway'. When we look at sequestered carbon, this has been less in past thermal max episodes of PETM (30% ELE 30MY recovery)and the Permian Great Dying(95% ELE and 50MY recovery). Then it also apparently did not release all the sequestered carbon but stopped at less. Estimated 70% from some(Permian, PETM less). This 'episode' could do the same. Still not a rosy thought. Runaway to 100% or some point below is probably the runaway called 'the Venus Effect'. Baked and boiled to no life possible. Ever. Or a worse than Permian ELE, with recovery in the many millions of years. Recovery from AGW in 400 years if people reduce emissions enough in time. Somehow, some way, natural, artificial, or Divine. I guess many of us will see it first hand, whatever happens. As reported before, previous hyper-thermals(not thermal maxes) stopped short of runaway at 1.5* C warming (global heat average). Do not depend on the IPCC or wiki. "2014 was one of the warmest years on record for America’s wintriest state. It was also the warmest for the Bering Sea and Anchorage’s warmest since 1926. In fact, for the first time in recorded history, the temperature never dropped below zero in Anchorage for a whole calendar year. “These are definitely red flags that are very consistent with climate change,” said Chris Krenz, senior scientist at Oceana, an international conservation group. “These are anomalies … that show our climate system is off-kilter.”"
"If commercial aviation were a country, it would rank seventh in global greenhouse gas emissions according to a recent report by the International Council on Clean Transportation (ICCT)." Then think about all the military emissions, probably equal. ALL WHEN WE NEED TO CUT EMISSIONS 90% in 9 YEARS!!!! I believe they are insane. Might as well go off the cliff faster? An enhancing feedback is just normal. CO2 goes up which generates water vapor which releases CO2 from water .... and so on until equilibrium. A runaway means to me a long term condition when the feedback process is not arrested for a very long period of time also commonly involving sudden mass burst releases resulting in many degrees of warming without human help. I know it by common usage, not by exact definition. My reading indicates to me that not much more than normal feedback is in the cards and the latter runaway scenario is not. Real Climate for instance goes into the methane business extensively and as I showed in the earlier graph we track from a much higher temperature going back 65 million years and I don't see where this runaway scenario shows up. But then, I could be wrong. I just want to be given examples of where I am. Since you are using your own definition of the term, you can claim whatever failure you wish and be happy with it. What the scientists used as a definition do show up in the long term graph where there were two large spikes of rapid warming, which would meet your requirement of lack of human input. The vague timeframe "very long" could also be said to have been met, but very long on a geologic scale is different than on other scales. What did the scientists come up with as a definition for runaway? And what makes you think the spikes had anything to do with a runaway, which at a minimum means a long term feedback spike, not say a bunch of volcanoes suddenly going off. You don't need to joust with me, just give me a long term multiple temperature change self-generated runaway specific. Give me specific evidence and I shut up. What did the scientists come up with as a definition for runaway? It does not have a single common definition, which is why it is not seen in use that much. You have chosen a definition on your own to use. And what makes you think the spikes had anything to do with a runaway, which at a minimum means a long term feedback spike, not say a bunch of volcanoes suddenly going off. Look at the scale for time on the graph, if the spike is visilbe it is by definintion long term, just maybe not as long term as you like with your personal definition. Volcanic action would not show up on such a long term graph unless it was continous over thousands of years since the scale is about 10 million years to the inch. That means 1/64 of an inch is over 150,000 years, which to some is a long time. For you who knows. Other than the two self-generated (unless you think humans went back in time or there were aliens involved), runaway (rapid warming until a higher equilibrium was established) specifics in the graph, which you say do not count? Perhaps you should add the definition of "warming" which requires a constant level of increase in temperature to be counted as such to the mix? Or perhaps that the "Green House Effect" has nothing to do with the actual physics of how a greenhouse works so it does not actually exist? That is essentially what is being discussed here now .... semantics and how one can define things after the fact. This example gives the reference to the range of definitions as indicated by the person mentioned, along with the specific defintion being used in this case. A common tactic is to change said definition and claim an error as a result. There is no way to refute such a claim to the satisfaction of the ones seeking the error so they claim a "win" in the discussion and we all come out worse in the long run. James Hansen says "Runaway greenhouse effect" has several meanings ranging from, at the low end, global warming sufficient to induce out-of-control amplifying feedbacks such as ice sheet disintegration and melting of methane hydrates, to, at the high end, a Venus-like hothouse with crustal carbon baked into the atmosphere and surface temperature of several hundred degrees. Between these extremes is the "moist greenhouse", which occurs if the climate forcing is large enough to make H2O a major atmospheric constituent (Kasting, 1988). In principle, an extreme moist greenhouse might cause an instability with water vapor preventing radiation to space of all absorbed solar energy, resulting in very high surface temperature and evaporation of the ocean (Ingersoll, 1969). Our simulations indicate that no plausible human-made greenhouse gas forcing can cause an instability and runaway greenhouse effect as defined by Ingersoll (1969), Sept 201​​ Climate Sensitivity, Sea Level, and Atmospheric CO2. ​​The runaway climate change that we're talking about result from multiple Arctic positive feedbacks. We are talking about methane which is 72 times more powerful as a global warming greenhouse gas than CO2 over a 20 period. In the case a large sustained methane emission from the Arctic the methane has 100 times the effect of CO2 over a 10 year time frame. ​​Each one of these is a powerful positive feedback in increasing the rate of global warming, as well as of course Arctic warming. Because they all occur in the same region of the Arctic, they will each reinforce all the others, a domino effect called cascading feedbacks. The Arctic warms more rapidly than the rest of the planet. (Arctic polar amplification)​​. The rapidly warming Arctic is already emitting methane from all the above sources.​​ As global warming is committed to increase and Arctic warming increases faster, we are now in a runaway planetary emergency situation. In the afore mentioned example, should we stop all emission of previously sequestered carbon, there would probably be no significant effect on the methane release unless other factors to lower the temperature were to occur and thus the self generating effect of the "runaway". If it were probable that a reduction of carbon emission now would prevent the continued methane release and the resulting cascade effect this would not be a "runaway" situation. That was a good post above with all the feedbacks. It is of the view that we are already in runaway and too late to stop even with a 90% of 1998 reduction in HGHGs by 2024. Of course others have the fantasy that we have until mid century to do that. So the dead zones increase to the entire oceans, before they get boiled away. It looks like the 350.org extrapolation of 8 years left to the ~94% HGHG reduction is also a fantasy, and unachievable by humanity anyway. It is merely academic to guess what percentage of 'turnover' we get. Worse than PETM or the Permian Great Dying, to 'baked Earth'? We know it is happening much faster, by many times over....much faster than people can grasp, and no adaptation that will save anything. The human population crash precedes permanent ruin of the biosphere. Seeing that is the worst thing that can happen, there is good reason to try to blow Yellowstone ASAP and just possibly stop the runaway. I have heard we should include Toba to get the Southern Hemisphere to get total global cooling for enough time. So let's try James Hansen's accessible definition for runaway warming since the Venus effect is not in the cards, "global warming sufficient to induce out-of-control amplifying feedbacks". Give me scientifically established specific examples of "out-of-control amplifying feedbacks" as opposed to the normal feedback leading to equilibrium process. What I'm not getting is this "out-of-control" business.